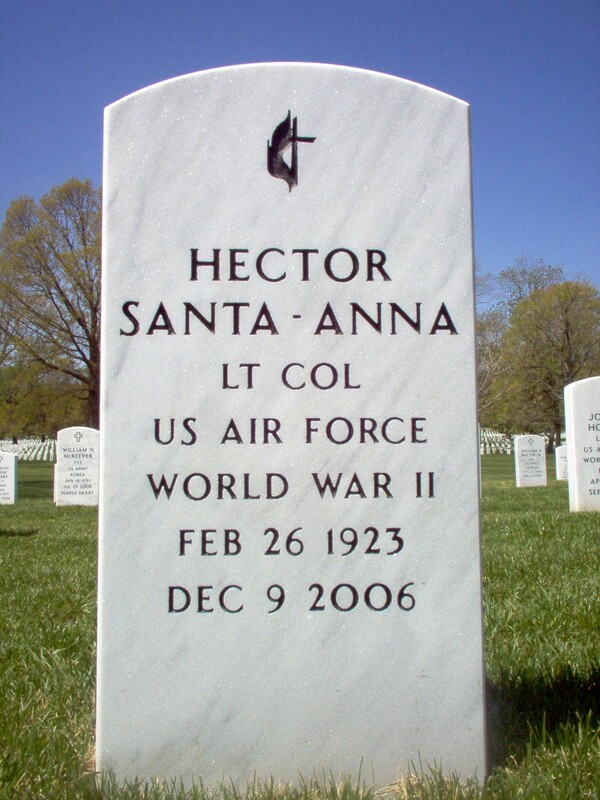 Hector Santa Anna, a bomber pilot who flew 35 sorties during a 17-week blitz over Germany during World War II and 127 missions in the Berlin airlift, and who later taught hundreds of pilots to fly before retiring as an Air Force Lieutenant Colonel, died December 9, 2006, of pneumonia at Kent General Hospital in Dover, Delaware. He was 83. Colonel Santa Anna, a former resident of Millersville who had lived in Dover since 2003, was one of the few Hispanic pilots in World War II. In recent years, he had been highlighted in books and documentaries, including Walter Cronkite's "Heroes of World War II." He was part of the U.S. Latino & Latina World War II Oral History Project at the University of Texas in Austin. The great-great-nephew of the Mexican general who captured the Alamo in 1836, Colonel Santa Anna was born in Miami, Arizona, and graduated from high school as World War II loomed in Europe. At 17, he wanted to join the Army, but his father persuaded him to get a college education. However, while working to save money for college as a miner in California, he visited an Army Air Corps field near Oxnard and was captivated by the pilots he saw there. Returning home, he joined the Air Corps, receiving his wings in 1943. Of the 97 cadets, he was the only Latino. "There weren't many Latinos taking flight training as an aviation cadet," he said in an interview for the oral history. "It wasn't easy being the only one. They would single you out, you know? With a name like Santa Anna, you stood out. Some would accept you, and others would not." Ultimately, it was his flying that made others take notice. For a while, he taught other Hispanics to fly at a basic training school in Waco, Texas. From 1944 to 1945 as a first lieutenant and B-17 pilot with the 486th bombing group based in England, he flew 37 combat missions over Berlin, Dresden and Munich. He logged more than 250 hours of flight time and was shot down several times. After the war, he returned stateside for training to teach instrument flying to other pilots. Then, in 1948, he again was assigned to Berlin, this time to airlift food and other necessities to the three Western sectors of the city blockaded by the Soviets. He made 127 supply runs into the blockaded area, his last on January 7, 1949. At a 40th anniversary event marking the Berlin airlift, Colonel Santa Anna talked about the importance of his missions. "It was worth it when I saw the faces of those Berliners each time we came in with our supplies; I knew it was worth it," he told The Times of London in 1988. "The Berliners unloaded our planes, patched up the runway, kept the radars operating. I will always remember their faces and the way they thanked us." Colonel Santa Anna, who was known as Jim, also helped to close down bases in the Azores and Brazil after the war. He was chief of the U.S. Joint Military Group's Protocol Office in Madrid in the 1950s and served as special assistant to the assistant secretary of defense for public affairs in the early 1960s. In the latter role, he was involved in the opening of Dulles Airport, the Paris Air Show and the New York World's Fair. He retired from the Air Force in 1964. His awards include two Distinguished Service Medals, five Air Medals and a Commendation Medal. After his military service, he graduated from the University of Maryland with a bachelor's degree in business and pursued graduate work in public administration at George Washington University. In 1964, he began working in public relations for the Federal Aviation Administration. He spent two years as chief of NASA's exhibit design and operations, traveling extensively on assignments, before retiring from the FAA in 1985. During the Nixon administration, he served on the President's Committee on Aging and was a member of the President's Cabinet Committee on Opportunities for Spanish-Speaking People. In retirement, Col. Santa Anna continued his passion for flight as a private instructor at the Navy Flying Club in Annapolis and more recently as a volunteer at the Air Mobility Command Museum at Dover Air Force Base. With more than 13,000 hours in the air, he flew every multi-engine aircraft of the period, from the B-17 Flying Fortress to the gargantuan B-36 Peacemaker, said his daughter Sylvia Willoughby of Crofton. In 2006, Colonel Santa Anna's life was portrayed in "Voices of Valor," a play that focuses on the Latinos who served in World War II and on the war's aftermath as a turning point in the struggle for civil rights and social recognition for Latinos. Col. Santa Anna, who was feted at the play's opening at the University of Texas, said: "I have a strong feeling that many of those people who fought in World War II have been forgotten." In addition to Willoughby, survivors include his wife of 61 years, Olive Santa Anna of Dover; a daughter, Cynthia Abi-Habib of Beirut; and five grandchildren. 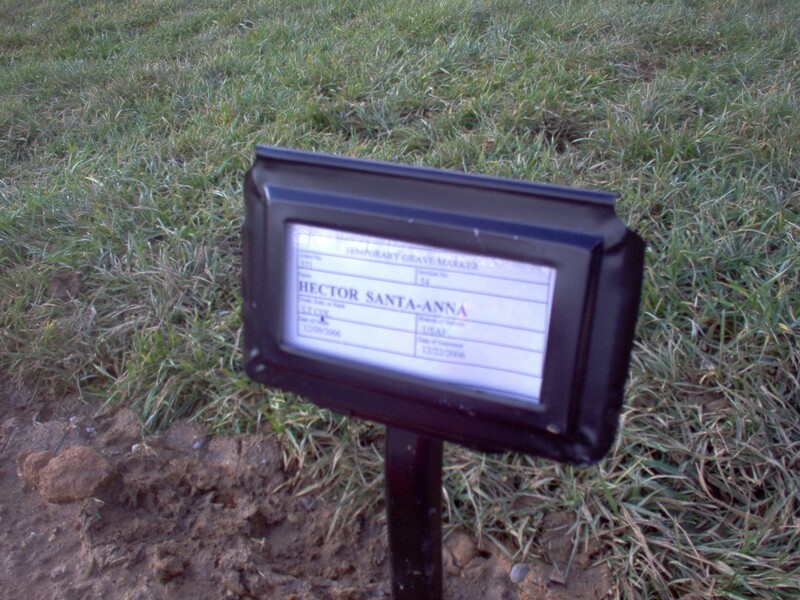 A resident of Dover, Delaware, formerly of Millersville, Maryland, passed away December 9, 2006 after a long illness. He is survived by his wife of 61 years, Olive; two daughters, Sylvia Willoughby and Cynthia Abi-Habib; and five grandchildren. Graveside services at Arlington National Cemetery, Friday, December 22, 2006, at 3 p.m. In lieu of flowers, the family requests memorial contributions be made in his name to the Air Mobility Command Museum Foundation, PO Box 02050, Dover AFB, Delaware 19902.